Identifying liquid water is crucial in the search for habitable worlds beyond Earth and for the search of life as we know it. "This discovery marks a significant milestone, highlighting what only Hubble can accomplish," said John Grunsfeld, associate administrator of NASA's Science Mission Directorate at NASA Headquarters, Washington. "In its 25 years in orbit, Hubble has made many scientific discoveries in our own solar system. 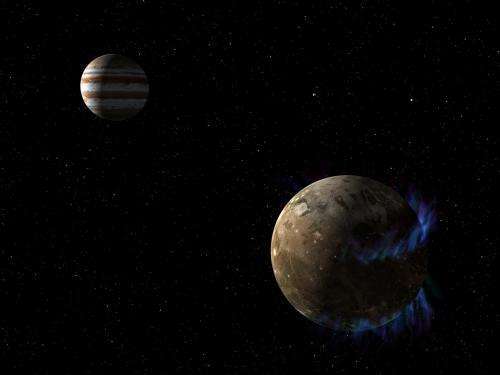 A deep ocean under the icy crust of Ganymede opens up further exciting possibilities for life beyond Earth." 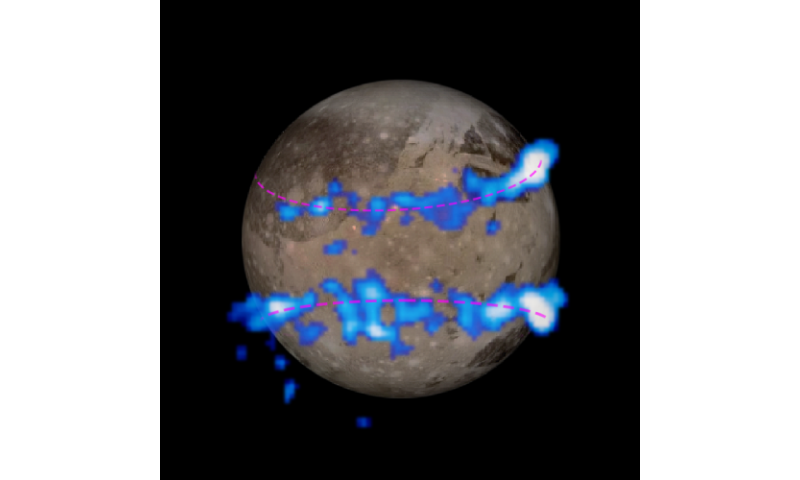 By watching the rocking motion of the two aurorae, scientists were able to determine that a large amount of saltwater exists beneath Ganymede's crust affecting its magnetic field. If a saltwater ocean were present, Jupiter's magnetic field would create a secondary magnetic field in the ocean that would counter Jupiter's field. This "magnetic friction" would suppress the rocking of the aurorae. This ocean fights Jupiter's magnetic field so strongly that it reduces the rocking of the aurorae to 2 degrees, instead of the 6 degrees, if the ocean was not present. Scientists estimate the ocean is 60 miles (100 kilometers) thick – 10 times deeper than Earth's oceans – and is buried under a 95-mile (150-kilometer) crust of mostly ice. The new observations were done in ultraviolet light and could only be accomplished with a space telescope high above the Earth's atmosphere, which blocks most ultraviolet light. 'Under ice' does not mean the same thing as 'under ground' or 'subterranean', at least to me. The words 'ground' and 'terra' seem out-of-place on an ocean planet, even one that is frozen over. Right - the correct term is 'subsurface ocean'. You know, it is this kind of thinking that I just love when reading papers. We really need to get these cyrobot missions going (Europa, Ganymede, Titan, etc. ). The potential mobility of a submerged probe is so much greater than any kind of land based rover. The words 'ground' and 'terra' seem out-of-place on an ocean planet, even one that is frozen over. A geophysicist's "planet" isn't the same as an astronomer's. A differentiated body as here is certainly a geophysical planet, and sometimes smaller bodies like asteroids. It depends on the context. That said, a subsurface ocean is clearer but since we can discuss surface "geoides" it is still open for conflation. Perhaps "subglacier (lat: 'glaciem') ocean" should be crystal [if not ice =D] clear. @FSC: US has restarted production of the RTG Pu isotope. But they did cut the development of the Stirling generator that would have doubled the number of missions that they get out of it. and the plutonium for these (Pu238) is running out. Plenty of bombs around that have that stuff. I couldn't think of a better use. It'd be win-win for everyone - not just science.